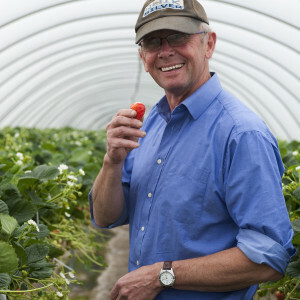 The Arbuckles have been growing fruit for 55 years at Star Inn farm , strawberries being introduced as a new enterprise in an otherwise traditional mixed farm in 1959. Situated at the east end of the renowned Carse of Gowrie and well known for quality produce locally the Arbuckle fruit enterprise is part of an extensive family farming business incorporating beef cattle, laying hens and a variety of cereal crops. The fruit enterprise is run by Peter and wife Susan , who have recently been joined by son Stewart. We endeavour to grow our fruit to the highest quality standards and in an environmentally friendly fashion. Our recently refurbished farm shop sells our own fruit and veg along with a variety of local produce.